On several website pages, Facebook pages and YouTube videos, you may have seen social share buttons. Free Social buttons have become a very important site promotional too that is being used by both small and large websites. Think about it, if you have uploaded an interesting video or if you have written topnotch quality blog post and if it has some sort of emotion to it, people may want to share your content with their friends or acquaintances through email or social sites like Facebook, Twitter, Google Plus and so on. There are 17 icons in various colors in this set that have both hover and link mode. They are great for blogs, websites, portfolios and much more. 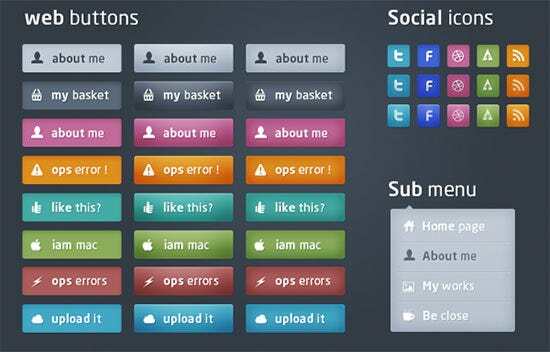 This set of social network buttons is colorful and simple. They have icons for all sites, including YouTube, Facebook, Twitter, Flickr and more. There are 152 icons in 4 sizes and 2 modes, including 3D and normal. They are available for all sites, including Tumblr, Google+, Facebook, Twitter, Instagram and more. For those who are looking for something different, then this set of neon colored icons is perfect. They are small and circle shaped and has all of the different social media sites. 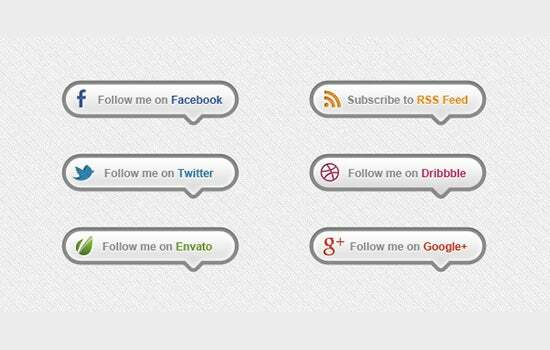 If you want pastel or light colored social network buttons then these are ideal. You can have options regarding the size, since there are big ones and smaller ones to fit every site. These flower based icons are perfect for your blog. They have options for Pinterest, blog, Instagram, creative market, Twitter, Facebook and more. This set can be used for any website that you are creating to allow your viewers to log in easily. They come in both retina and standard options with 7 icons. Facebook has their own unique set of UI elements and these social network buttons are now available for download. You can find the connect icon, like, share and much more. If you want different types of icons on your website, then this is perfect. There are 18 large icons, 51 icons that are 32 pixels in size and 20 icons that are 16 pixels in size for all social media sites. This icon looks like a pin that you can wear on your clothes. It is available in 5 sizes and can be ordered in square and circle shapes. For those who want a more vintage and retro look, this is the perfect set. There are 4 icons, including for Twitter, Facebook, About me and more. If you use YouTube a lot, then you want this button. It can be found in various sizes and shapes and is easy to order. This is perfect to help your viewers to sign into your website. You can allow them to use Facebook, Twitter or Google+ with just a single click. These are ready to use and you can use them to help get connected on various social media sites. There are options for downloads, Twitter, Facebook and more. Valuable content can only be shared to others if your website is equipped with a plugin that allows visitors to easily share your content on different social sites without actually visiting the social sites and adding the content. When someone shares your content by clicking on the Best social button, your content will be shared on their social accounts. And their friends and connects will also come to know about the content that you have shared. This way more and more people will easily share your content and they will visit your websites. So, social buttons can ultimately help in driving healthy and targeted audience to your site which will ultimately improve the ranking of your site on search engine. The power of social buttons is such that your videos can be easily become viral in no time. Even though there are ways to drive traffic to your site, social buttons can work for kind of a website and boost traffic to it. Anyone who wants to be connected on the popular social media should use these icons. You can set them up to help the viewers to see your page or to help them login or share using them.